Homepage > PEUGEOT 407 HORTAZ 17" ALLOY WHEEL [Fits all 407 models] 1.6 2.0 2.2 V6 HDI NEW! PEUGEOT 407 HORTAZ 17" ALLOY WHEEL [Fits all 407 models] 1.6 2.0 2.2 V6 HDI NEW! Hortaz alloy wheel - 7.0J x 17" - tyre size 215/55 x 17". 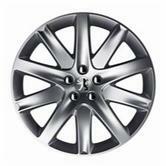 This alloy wheel will accentuate your cars sporty aspect, give it an original look and enhance its dynamic character. Price excludes tyres. 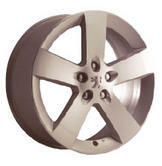 Product Description: Hortaz alloy wheel - 7.0J x 17" - tyre size 215/55 x 17". This alloy wheel will accentuate your cars sporty aspect, give it an original look and enhance its dynamic character. Price excludes tyres. PEUGEOT 407 NINETEEN 19" ALLOY WHEEL [Coupe models] V6 HDI GENUINE PEUGEOT PART! PEUGEOT 407 HORTAZ 16" ALLOY WHEEL [Fits all 407 models] 1.6 2.0 2.2 V6 HDI NEW!